Saint Francis Xavier, Priest – Saint of the Day from My Catholic Life! Today’s great missionary knelt down next to Saint Ignatius Loyola and five other men in a church on Montmartre overlooking Paris in 1534 and took private vows of poverty, chastity, and obedience to the Pope. It was the start of the Jesuits. 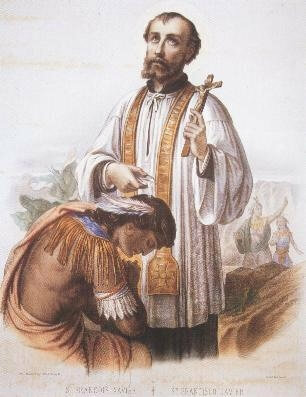 Francis Xavier would be ordained a priest three years later in Venice and, in 1540, would sail from Lisbon, Portugal, to India, never to return. The thirteen month sea journey was brutal, but Francis was as tough as bark. He held his own with all the sailors, slaves, and criminals on board who were seeking to start anew for reasons noble and otherwise. When Francis arrived in Goa, India, he and his two confreres found a Portuguese settlement about thirty years old. As was sadly typical, the greatest hindrance to the success of Spanish, Portuguese, and French missionaries was their own countrymen. Slave traders, merchants, pirates, nobles, and crown officials gave a contrary Christian witness which undercut the priests’ own teaching and example. It was said that when the Portuguese whipped their servants, they counted the lashes on their rosary beads. Francis’ first goal was to evangelize the settlers. He preached, taught, heard confessions, and encouraged the Portuguese to live their baptismal faith if they harbored any hope of winning India for Christ. After working among his own for a few years establishing the basic structures of an organized church, including a seminary, Francis went on the first of his incessant voyages, the sub-missions inside of his greater mission to Asia. Among the people of the islands near modern-day Sri Lanka, Francis slept on the dirt like they did. He ate rice and drank water like they did. He put the Our Father and Hail Mary to music and so made these prayers easier to remember. He became a father to a humble people and baptized so many thousands that helpers had to hold up his arm to continue his sacramental work. That very arm is found today in a reliquary in the Jesuit’s mother church in Rome, the Gesù, near the tomb of Saint Ignatius Loyola. Francis used Goa as his base as he departed on one missionary journey after another among the islands off southeast Asia. He wrote letters to Ignatius and to the King of Portugal describing his labors and plans, bemoaning the lack of priests and the unethical behavior of his fellow Europeans. On one journey, he heard of an island archipelago that no European had yet entered. It was Japan. Francis started to plan and, in 1549, he was the first missionary to plant his foot in the Land of the Rising Sun. The work was difficult. As so many Europeans noted, Japanese culture was fundamentally unlike other Asian cultures. The Japanese were intellectually sophisticated, sensitive to slights, honorable, open to reason, and naturally inquisitive. But the language was impenetrable, the leaders often hostile, and the monks welcoming only until they realized that Francis’ religion was a rival to their own. An expert missionary, Francis had to create a neologism adapted from Latin—Deusu—to convey the Christian concept of the word God. No equivalent existed in Japanese. After little visible success in Japan, Francis had further adventures on land and sea before he embarked on a plan to enter the vast and forbidden territory of China. But it was not to be. On December 2, 1552, Francis Xavier died of fever at the age of forty-six on a small island a few miles distant from the shores of mainland China. Like Moses, he died seeing the promised land but never entered it. Francis was buried in a shallow grave in the sand as four people looked on. His body was covered with lime in case anyone wanted to recover it later. They did. This Apostle to the Indies and Japan was canonized in 1622 and is considered the Church’s greatest missionary after Saint Paul. His body is largely incorrupt and rests in a glass coffin in a church in Goa, India. Saint Francis Xavier, your indefatigable journeying to spread the Gospel inspired generations of missionaries. May your legacy of generosity and vigor continue in us as we convert others through our own witness of virtue, work, and charity for all.